However, technically, trains will not be running along the entire Pink Line before next year as land acquisition woes continue to persist in east Delhi's Trilokpuri. Delhi Metro’s Phase III, in its entirety, is now expected to be operational only in September, when the last stretch of the 58-km Pink Line will be opened. The entire 34-km-long Janakpuri West-Botanical Garden Magenta Line, a part of which is already open, will be thrown open in May, according to the Delhi Metro Rail Corporation (DMRC) Phase III progress report. 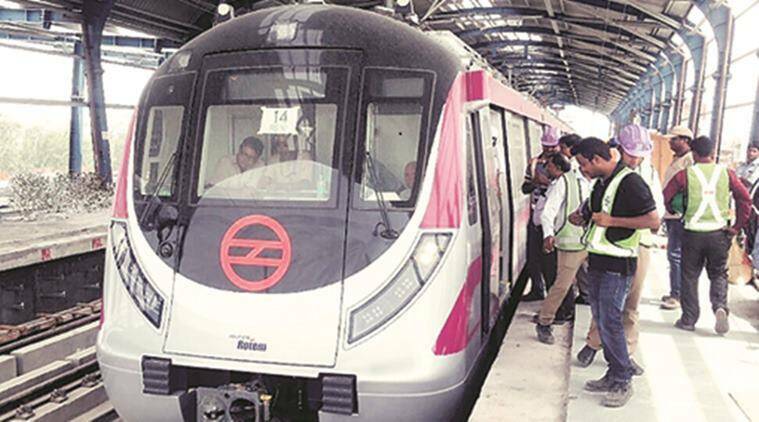 DMRC chief Mangu Singh told The Indian Express that the Magenta Line is “ready to be launched” after the mandatory safety clearance, which is still awaited. On the other hand, the Pink Line, which will be Metro’s longest corridor once opened, will see a staggered launch over July, August and September. “The sections — Durgabai Deshmukh South Campus to Lajpat Nagar, Lajpat Nagar to Mayur Vihar Pocket-1 and Trilokpuri to Shiv Vihar — are expected to be completed by July 18, September 18 and August 18 respectively… progress of civil works is 96.72 per cent,” states the latest progress report. However, technically, trains will not be running along the entire Pink Line before next year as land acquisition woes continue to persist in east Delhi’s Trilokpuri. “Progress of civil works up to February 2018 is 96.72 per cent. The line is planned to be opened in stages by September 18 (except Trilokpuri to Mayur Vihar Pocket-1 section due to land issue at Trilokpuri),” the report adds. Singh said Metro has depots on both sides of Trilokpuri and this will enable it to launch services irrespective of construction progress in the east Delhi neighbourhood. He said around 108 families have been affected by Metro construction in Trilokpuri, of which, the DUSIB has provided land to DMRC to accommodate around two-thirds of them. “The main issue is resistance being faced in building housing units at the new site. You cannot shift people to farway places,” Singh said. He pinned the blame for the delay on the Land Acquisition Act, 2013. “This is the difference between the phases — in Phase I and II most of the issues could resolved as the Land Act gave us ample ease in acquiring. I don’t think anybody has acquired land under the new Act. At least in Delhi. However, in Phase III also, we could tackle private land fairly well by negotiating directly with the parties,” he said.